What's on the minds of the stars of UFC Fight Night 100? What’s on the minds of the stars of UFC Fight Night 100? WHAT’S ON THE MINDS OF THE STARS OF UFC FIGHT NIGHT 100: BADER vs. NOGUEIRA 2? Rogerio Minotouro: I started doing this sport when almost nobody knew it in Brazil and today I am headlining a card in the country. It’s a dream come true, without a doubt. This fight means a lot to me. Besides the rematch, it confirms the good moment I am in after knocking out (Pat) Cummins in Curitiba. Bader is a strategic guy, strong, likes to go to the ground, but I am conscious of everything that I need to do to take out his game. Albert Morales: Thomas is a strong fighter who will be fighting at home, with the whole crowd there to support him, but I like to feel pressured. My plan is to imagine that the cheers of the crowd are for me rather than for him. But the truth is that I feel that my moment is here and I can see myself submitting him. That is my goal. Claudia Gadelha: I transformed myself into a new athlete, much more focused on what I need to do. The time I spent in the United States taught me the right way to train and I feel very good about my body and my health. Cortney is a very big and strong girl for the division and I believe that she will use that as an advantage over me. I can’t stop in front of her, I have to impose my game and that is what is going to happen. I can guarantee that it will be an MMA fight, everything will happen. Cortney Casey: I am very excited about being in Brazil, the people here are amazing, and I can’t wait to have a big performance on Saturday. I hope for a good fight, very aggressive, where I intend on focusing on my wresting to win. Claudia Gadelha is number one in the division, she is a very good and strong fighter, but my idea is to keep my game plan and shock the world. Warlley Alves: It may be a knockout, a submission, it doesn’t matter, I just want to leave with a win. Kamaru is a very tough athlete. He likes to fight moving forward and he is strong. In reality there is no weak fighter in the UFC. 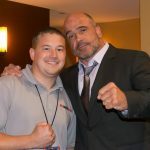 Both of us were on The Ultimate Fighter and won, so I believe that a win would make me the winner of his season. In all seriousness, this is a win that I want more for me personally than professional. I need this win. Kamaru Usman: He is young and strong but I am sure that I have much more experience than him in this game. If he comes to fight the same way he came in for his last fights, I am sure that it won’t be a good day for him. I will stay loose, do my game and show the skills that people have not yet seen in the UFC.